Go to Firedoglake right now for her latest post on Cheney's troubles. Huge, hat tip to her and yes, I pilfered the "Scarface" image of Cheney because it was just too damn good to pass up. 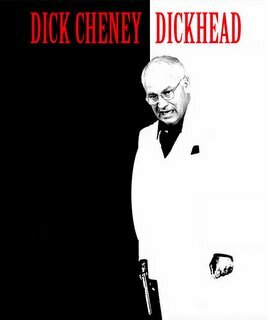 It's so perfect and the quote above from the movie "Scarface" epitomizes the entire persona of Cheney and the entire WH contingent.